Bishop Robert W. Muench delivered a closing address and prayer to area scouts during the annual Catholic Committee on Scouting Religious Awards Ceremony on Sept. 7 at Our Lady of Mercy Church in Baton Rouge. Representatives from the Boy Scouts, Girl Scouts and Cub Scouts attended the event, which opened with Deacon Richard Grant delivering the invocation. The purpose of the Catholic Committee on Scouting is to bring the Religious Emblem Program to the scouts registered in the Girl Scouts, Boy Scouts, Camp Fire and American Heritage Girl Scouts Youth Program in the Diocese of Baton Rouge. Assisting in the funding of the program are the Louisiana Knights of Columbus Councils and the Bishop’s Annual Appeal. Five adults won the Bronze Pelican Award, which recognizes men and women who have directly contributed to the spiritual development of the scouts. The winners included Brandi Aydell from Our Lady of Mercy, Brian Aydell from Our Lady of Mercy, Ann Bernard from St. Aloysius Church in Baton Rouge, Angela Poche from St. Theresa Church in Gonzales and Renee Sims from St. Jude Church in Baton Rouge. Nancy Simien received the prestigious St. George Emblem, which is the highest National Catholic Committee on Scouting Award achieved in the Boy Scouts. The diocese was also awarded the Quality Diocesan Award for the 10th consecutive year. 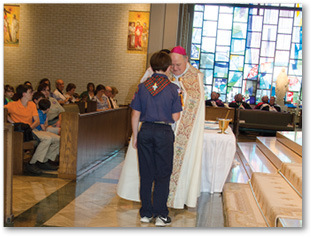 The award is presented to dioceses that promote and achieve a quality Catholic scouting program.